Almost one year ago, I wrote this article to demonstrate how to create a responsive datagrid component in Lightning. Recently, when I went back to the post, I realized that responsive table component in Lightning could be a lot more easier. So, lets see easier and efficient approach to create a Responsive and Generic Table component in Lightning. First and foremost, we need to provide data in below JSON format to Lightning component, everything else would be taken care by component itself. In aura:iterator component, we cannot use indexvar to refer other list. 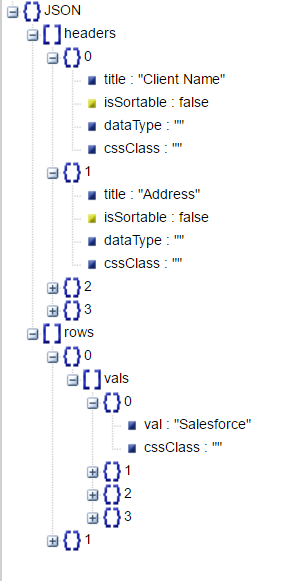 If this was possible, then instead of defining cssClass for every column, we could have easily read it from headers. Above Lightning application is created to test responsive datagrid component. We have used ltng:require tag to import Salesforce Lightning design System (SLDS). Hi i m looking out for custom account hierarchy cmp in lightning that can be called any where which is exactly replica of standard account hierarchy with expand and collapse functionality. I am facing issues with expand collapse .